A website built by CuCo Creative for one of modern history’s foremost politicians has gone live and attracted nearly 1,000 hits in its first week. 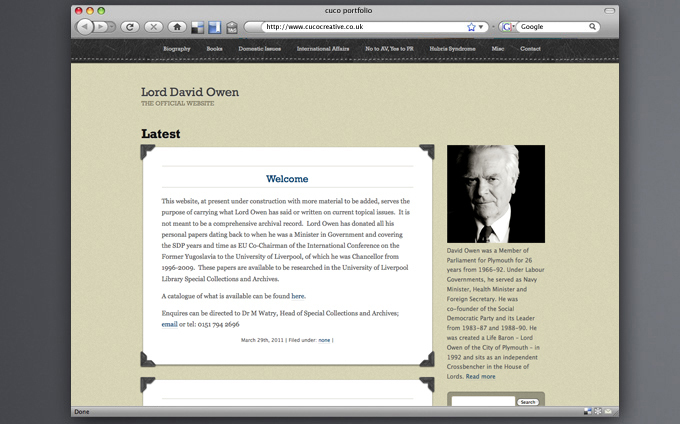 www.lorddavidowen.co.uk is the new online platform for the former Labour minister and SDP leader’s many academic, political and literary interests. The site has been created on a WordPress platform and was turned around in two days. Lord Owen, now an independent Crossbencher in the House of Lords, asked CuCo to build his site following our successful development of www.charter2010.co.uk in the run-up to last year’s General Election. The peer was one of the driving forces behind Charter 2010, a cross-party group which campaigned presciently for candidates to embrace the likelihood of a hung parliament. The new web design with its subtle tints and textures was the perfect fit for a parliamentary figure of such distinction and international renown, said CuCo director and senior designer Tony Cook. Working with Lord Owen on Charter 2010 was a great experience and we are delighted to link up with him again on the website project. With one eye firmly on the forthcoming May referendum on electoral reform, part of the site is devoted to the No to AV, Yes to PR campaign which Lord Owen joined earlier this month. Other sections embrace his thoughts on domestic and international affairs, including key speeches, newspaper articles and a comprehensive bibliography.